References made from this web site to any products, services or information, other than those provided directly by Heritage Homecare, does not constitute an endorsement or recommendation by Heritage Homecare or any of its employees. The information contained on this site is considered accurate and timely. However, all information contained on this site is subject to change without notice. Heritage Homecare is not responsible for the contents of any "off-site" web pages referenced from this server. Although our pages include links to sites including or referencing good collections of information, Heritage Homecare does not endorse any specific information, products or services provided by public or private organizations. In addition, health care information on the web can be a valuable resource to everyone, however, it is general in nature. The word "Partners" makes no inference that any type of partnership and/or venture of any kind exists and infers that only a professional relationship exists. 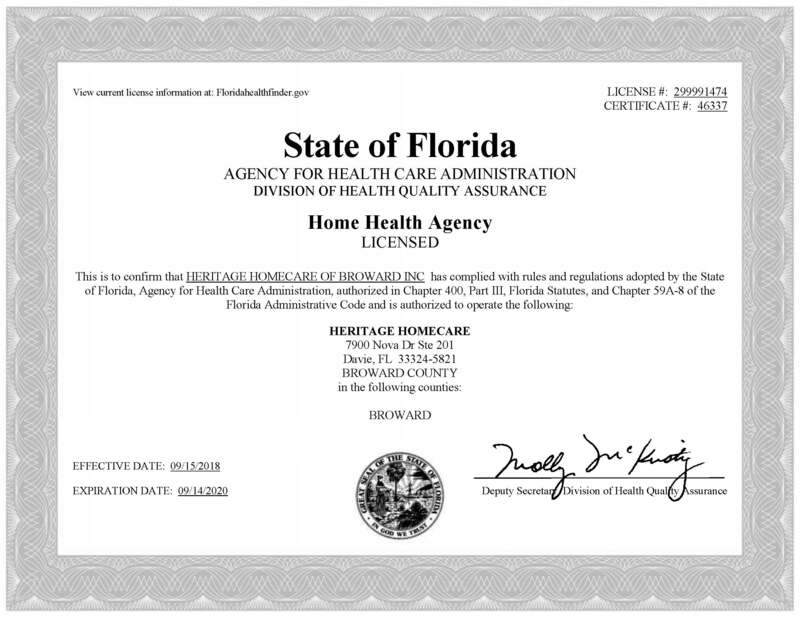 Interested parties can verify licensing information, if applicable, by visiting the State of Florida's web site for oversight of health care entities: Agency for Health Care Administration. Due to the high amount of spam email, Heritage Homecare reserves the right to block email from any domain/sender at its sole discretion. All email for this domain is viewable by administration. Form submission request or telephone contact will assure that any request for information is received by our office.